Read-out Instrumentation Signpost: Diferential noise measurement. Anritsu Corporation has introduced industry’s first solution capable of conducting extensive characterization of the differential noise figure of differential devices used in high-speed wireless communication systems. 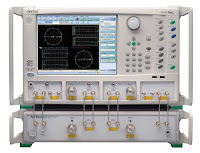 The solution, which integrates a new differential noise figure option into the Anritsu VectorStar™ vector network analyzers (VNAs), allows R&D engineers to verify the receiver performance of low noise amplifiers (LNAs) and other devices used in the front-end of 5G and microwave back haul systems. The new differential noise figure option enhances the 2-port single-ended noise figure measurement capability of the VectorStar and allows the VNAs to measure 3- and 4-port devices in single-ended, differential and common mode operation with a variety of processing options. The Anritsu differential noise figure option incorporates the similar cold-source measurement technique as its 2-port method, which minimizes mismatch errors for improved accuracy compared to the conventional Y-factor noise source method. The new enhanced noise figure option adds the ability to perform levels of vector correction in 2- and multi-port devices for greater accuracy particularly, when mismatch is significant. Measurement analysis of both correlated and uncorrelated noise can be conducted with the new differential noise figure technique. The result is more comprehensive characterization of actual device performance for greater design confidence. It is a superior method than conventional approaches that include an RF balun with only an S-parameter description or neglect correlation between device under test (DUT) output ports, which lead to improper characterization of differential devices. As operating frequencies continue to rise due to 5G, the ability to more accurately characterize device performance will take on added importance. The MS4640B VectorStar VNAs have the broadest coverage in a single instrument, 70 kHz to 70 GHz. Coverage can be extended to 145 GHz and 1.1 THz in broadband configurations. VectorStar is the only VNA platform capable of measuring noise figure, both single-ended and differential, from 70 kHz to 125 GHz. 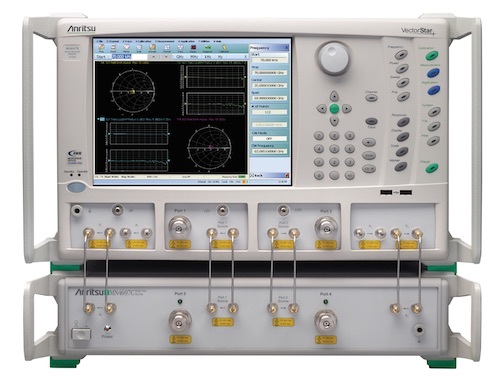 The MS4640B VNA series offers a new level of performance for device modeling engineers struggling to accurately and reliably characterize their devices, for R&D engineers pushing the last fraction of a dB out of their state-of-the-art designs, and for manufacturing engineers who must maximize throughput without sacrificing accuracy.